Harvest is absolutely the busiest time for winemakers. This year was particularly busy because it seemed everything ripened at the same time, which meant all of the fruit was delivered to the wineries and needed to be processed at the same time. Even with a busy schedule, our partners at Kosta Browne Winery were kind enough to let us come by for a visit with our friends from SoCal, Jill and Steve Edwards. 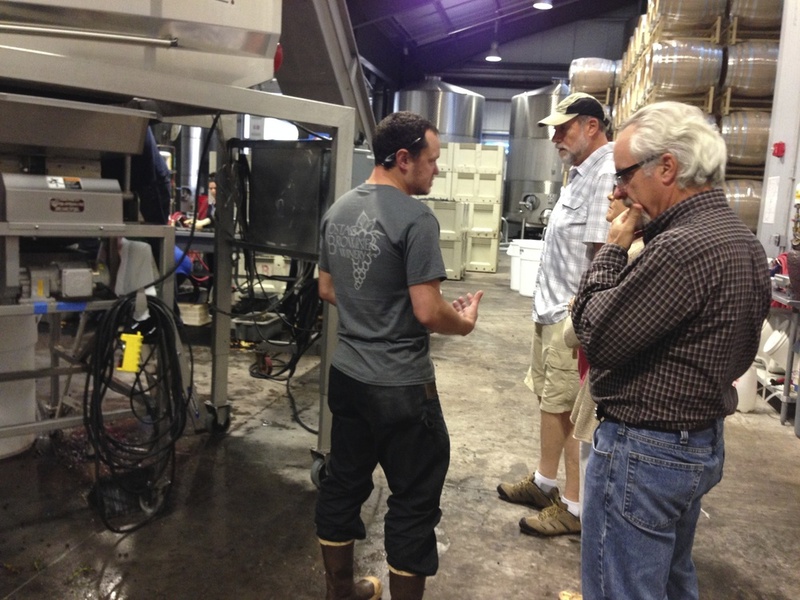 Rather than the typical winery tour, we were given an eyes-on experience of the production process in full swing. Assistant winemaker Jeremiah Timm took time from his 18-hour day in the winery and lab to walk us through the winemaking process. First, we saw bins full of recently harvested fruit waiting for processing. The fruit goes through a destemmer, which removes the stems, and then is taken to the sorting table. Fruit is discarded that is too heavily raisined, mildewed or shows imperfections that do not pass Kosta Browne’s rigorous standards. For the Chardonney, the fruit goes through a press which splits open the berries to get at the sweet, juicy goodness inside. 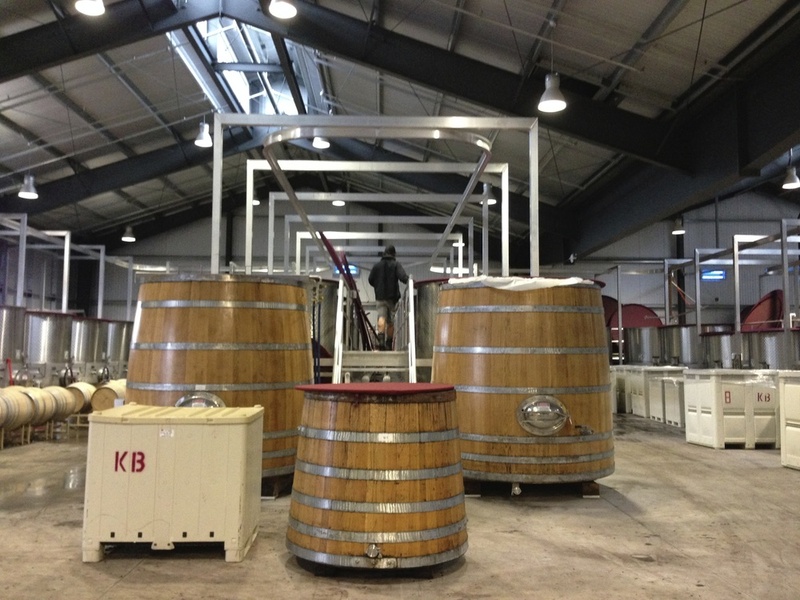 The Pinot noir fruit goes into large jacketed tanks for a “cold soak”. This cools the grapes down, giving the skin more contact time with the juice to extract color and flavor. Dry ice is added to assist with cooling and protect the fruit from oxidation and fruit flies. The volcanic reaction in the huge tanks was certainly a sight to see! We wrapped up the day with a visit to the barrel room and a taste of the two barrels that are our 2013 vintage. 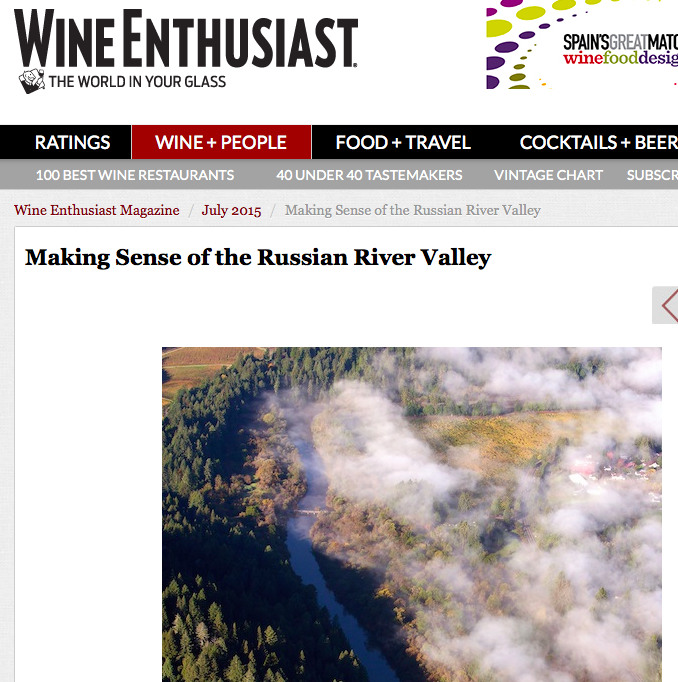 Thank you to Russell Batt, who manages Kosta Browne’s VIP relations, for making this possible. Now we will get out of your hair and let you all go back to making phenomenal wine! Newer PostThe Boys of D.C.